Last month, late night comedian Stephen Colbert launched a "super PAC," the newest form of political fundraising committee, allowing him to reprise his previous efforts to lampoon the outsized role of corporate money in American elections. But over the past month, what started as a humorous dressing down of the U.S. Supreme Court's landmark campaign finance ruling in the case of Citizens United has turned into a unexpectedly serious look at the complexities of the way the government regulates political spending. In recent days, campaign lawyers of all stripes have weighed in on the legal issues facing Colbert's super PAC, and the comedian himself had to hire a high-powered Washington election lawyer to try and resolve whether talking about his fundraising committee on his late night show, "The Colbert Report," actually could create legal headaches for Comedy Central's parent company, Viacom. Last week, Colbert sought formal guidance from the Federal Election Commission on several tricky legal questions. Though when he arrived in Washington to submit his request to the regulatory panel, he made it abundantly clear this is still more about laughs than anything else. Colbert proclaimed that his super PAC, called Colbert Super PAC, would use the money it raised for political ads, but also for "normal administrative expenses, including but not limited to, luxury hotel stays, private jet travel, and PAC mementos from Saks Fifth Avenue and Neiman Marcus." ABC News cameras were on hand when he pushed through a crowd of reporters gathered outside the normally staid and sparsely attended FEC meeting. 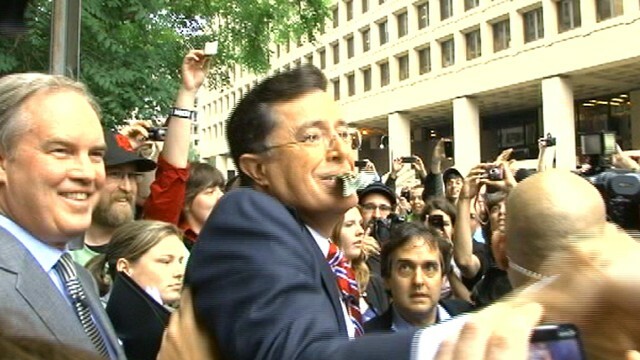 "I believe the Citizens United decision was the right one -- there should be unlimited corporate money -- and I want some of it," Colbert said. "I don't want to be the one chump who doesn't have any." The real issue facing the FEC is whether the air time Colbert uses to promote his super PAC could be legally construed to be an in kind corporate contribution, and if so, whether Viacom will be forced to try and determine how much that air time is worth. Prominent Washington election lawyer Trevor Potter, who served as chief counsel to Sen. John McCain's 2008 presidential campaign, is trying to join his client in straddling the line between yuks and genuine legal questions. On one day, Potter filed papers with the Federal Election Commission to help clarify Viacom's legal responsibilities. On another, he appeared on Colbert's show to loft softballs for easy punch lines. "Can you name anyone who has gone to jail for breaking the law with their PAC?" Colbert asked Potter on one recent episode. "Not a person," Potter replied. "Ah," Colbert shot back. "That's my kind of law!" Those on both sides of the debate have seen something of value come from Colbert's tongue-in-cheek routine. "I think he's trying to use his modus operandi to make a very serious point," said Fred Wertheimer, a longtime advocate for campaign finance reform. "Namely, that the Citizens United decision has created real and fundamental problems for the country." Bradley Smith, a campaign law expert who has endorsed the court's ruling, said Colbert may be mocking the decision, but also inadvertently showing that, even for someone with an enormous megaphone, trying to work within the confines of government restriction has been ungainly and challenging. "I think he's missing the point," Smith said. "As a person with his own TV show, he has this great platform, and yet he's still encountering obstacles." Scott Thomas, a former FEC commissioner, said his former FEC colleagues have a challenge on their hands. Some aspects of Colbert's filing are clearly going to be tough to take seriously. But there are implications, he said, for other political figures who make partisan appeals on television news shows. "Depending on how the FEC rules, this could turn into a green light for Fox or MSNBC to start to allow personalities to actively solicit donations on their shows," Thomas said. +Citizens United v. the FEC: The Return of Corporate Influence Peddling?